In today’s episode, we will resume our discussion about dawr “El-ḥelū lammā in‘aṭaf” written by Ismā‘īl Bāshā Ṣabrī and composed by ‘Abduh Afandī al-Ḥāmūlī to the bayyātī maqām, muḥayyar sub-maqām, and the 3-pulse’ dārij rhythm. We will dedicate today’s discussion to how modernists dealt with this dawr’s form in the phase following the period it was composed in. 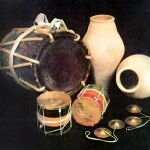 We do know that in the 1960’s and 1970’s, dawr started to be performed following a score, and sometimes collectively. Yet, there was another phase before this one when Kārim Maḥmūd, among other muṭrib, sang these dawr. The recording of Mr. Kārim Maḥmūd. Sayyida Saniyya Safar ‘Alī, an amateur singer who never made a career of singing, transformed this dawr into a ṭaqṭūqa: each time she sang one of the dawr, she went back to the madhhab, i.e. to the lyrics of the madhhab. She actually did not change the melody of the dawr a lot. Moreover, she performed her tafrīd in the last dawr “El-ḥubb ḥāluh ‘agab, yilidhdh fīh el-‘adhāb” to a 4-pulse’ rhythm –whether we decide to call it bamb or maṣmūdī, this is unimportant. The point is that by the mere fact of taking up the rhythm of Safar Bēk ‘Alī, she affirmed that it was transformed into a 4-pulse’ rhythm. Her performance of the tafrīd is the same as Umm Kulthūm’s in “El-awwila fī el-gharām”: “Ḥaṭṭēt ‘a-el-albi īdī we-anā ba-wadda‘ waḥīdī” for example. After the tafrīd, she went back to the lyrics and the melody of the madhhab then concluded the dawr by slowing down its melody in the end. This slow pace surely does not exist in the traditional performance of this dawr. Safar ‘Alī apparently had given her instructions in this concern. Still, the traditional way of performing the dawr did certainly not include this slow pace at the end, such as the performance of Ṣāliḥ ‘Abd al-Ḥayy for example of dawr. Let us listen to this type of tafrīd and khatm and note how the dawr was transformed, in a way, into a ṭaqṭūqa or into a 1940’s song. Kārim Maḥmūd transformed this simple dawr –we forgot to mention that dawr “El-ḥelū lammā in‘aṭaf” is a simple dawr like “Gaddidī yā nafs ḥaẓẓik” or “Yā ḥlēwā yā msallīnī” where the melody of the madhhab is the same as the melody of the dawr, and the performer must weave his own tafrīd onto this melody. It contains neither tarannum, āhāt, nor waḥāyid. i.e. the responsorial section between the muṭrib and his biṭāna. Kārim Maḥmūd took this dawr in its simple form and transformed it into a dawr that complies with what is written in books: a madhhab, a tafrīd, a tarannum or āhāt, waḥāyid, and finally the qafla. He performed it in its full structure –like Dāwūd Ḥusnī, Sayyid Darwīsh, or Zakariyyā Aḥmad– that is almost the last of dawr structures, with the exception that the rhythm remains the same. In fact, and as mentioned earlier, this dawr is originally to a different rhythm than all other dawr. Let us go back again to the tafrīd of ‘Abd al-Ḥayy Ḥilmī in “El-ḥubb ḥāluh ‘agab”, and to Kārim Maḥmūd’s tafrīd. … There is something of Dāwūd Ḥusnī. Then he gives an evolved performance of the waḥāyid, i.e. unlike, Muḥammad ‘Uthmān’s performance of waḥāyid for example, and more like Dāwūd Ḥusnī’s in his latest dawr, as well as Sayyid Darwīsh’s and Zakariyyā Aḥmad’s. He starts at the qarār to the bayyātī. The qafla here is unclear. They either told him not to exceed ten minutes, or there was a third waḥda that he did not sing for some reason… I do not know. His going back to “yilidhdh fīh el-‘adhāb” added to the strange and sudden qafla are odd. The qafla is followed by a lāzima that concludes the dawr. I do not know why it was added… Was it to replace the layālī and the taqsīm to the bamb for example? I truly can’t understand the role of this lāzima in the end. Let us listen to the entry of the rāst to the qafla and the lāzima. Before listening to Kārim Maḥmūd’s full recording, let me highlight a point: Kārim Maḥmūd performs the dawr with a large band, one of those used starting the late 1930’s and the 1940’s, that included a row of violins, cellos, and double-bass, playing harmonic bass. Personally, if I were to advise someone on how to perform dawr, I would not advise to play them like this… any dawr, not only “El-ḥelū lammā in‘aṭaf”. Because the 1940’s type of band destroys the dawr’s major elements, i.e. the improvisation and the interaction amongst the performers: when there is a row of violins and someone playing harmonic bass, there is no more improvisation, because if all the violins improvised, there would be chaos. Even though the tafrīd violin soloist ‘Abd al-Min‘im al-Ḥarīrī conducts a dialogue with Kārim Maḥmūd and performs beautiful bow strokes. Truth be told, Kārim Maḥmūd in this recording of the dawr cancelled this theory: he performed the dawr with all its elements, leaving nothing out… even if some instrumentalists were reading a score. Yet Kārim Maḥmūd himself truly performed the dawr fully. I do not agree with him but I respect him very much concerning the band issue. We have discussed this issue, and the difference in opinion in no way harms it. This is not criticism: I am affirming that Kārim Maḥmūd truly met all the requirements of the dawr performance from A to Z. 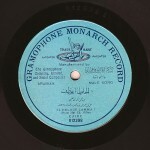 The dūlāb is replaced with a lāzima or a vocal overture very much like any 1940’s or 1950’s song, but also inspired from dūlāb melodies. All the recordings we heard in the previous episode start to a 4-pulse’ rhythm dūlāb then shift to a 3-pulse’ rhythm. Here, the instrumental overture respected the dārij rhythm of the dawr and followed it. Actually, I do not know who composed it… Maybe Kārim Maḥmūd himself, or ‘Izzat al-Jahlī, or another. 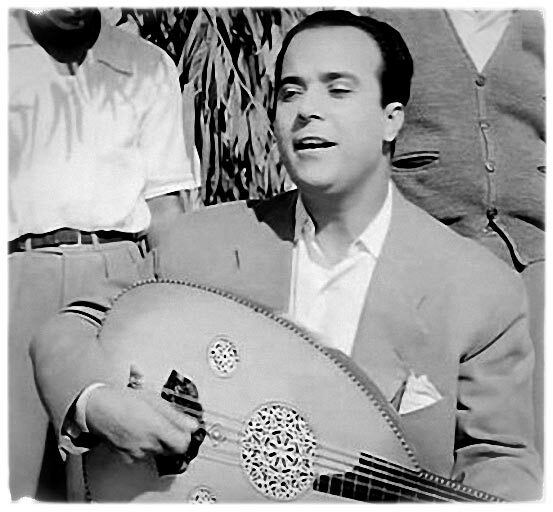 This performance of the dawr was recorded from the radio: it seems that Kārim Maḥmūd sang it live on-air, or that the dawr was broadcasted at a certain point in the 1950’s or the 1960’s, and ‘Abd al-‘Azīz al-‘Anānī thankfully recorded it from the radio. We tried to clean the recording as much as possible, so we hope you will forgive the imperfections you will hear. Let us listen to dawr “El-ḥelū lammā in‘aṭaf” written by Ismā‘īl Bāshā Ṣabrī and composed by ‘Abduh al-Ḥāmūlī, performed by Kārim Maḥmūd with the Egyptian Radio’s band, accompanied by Kāmil ‘Abdallāh (qānūn) –I think–, and as we said ‘Abd al-Min‘im al-Ḥarīrī’s violin is among the other violins, Ḥusayn Mu‘awwaḍ (percussions) –probably–, maybe Maḥmūd ‘Iffat (nāy) at the beginning of his career. But I am honestly not sure who the instrumentalists are. The one with the special voice is Muḥyiddīn al-‘Arabī, the chorus leader. We need to go back to the Radio’s archives, if they still exist, to find out who played in the Radio’s band in Kārim Maḥmūd’s recording of this dawr. We will end today’s episode with dawr “El-ḥelū lammā in‘aṭaf” performed by Kārim Maḥmūd. “Sama‘ “ is brought to you by AMAR.